If you grew up in New York you'll love this video. If you know someone from New York, you'll love this video. If you went to Penn, you'll probably love this video. It's the latest short comedy musical from DJ Lubel (C'05) and it's all about New York (Murray Hill to be exact) and his circle of hebrew school graduated, sleepaway camp and teen tour loving friends. Not only is it clever, but it's well directed and produced. If you recall, DJ did a FANTASTIC comedy musical on how much he misses Rick Moranis! Check it our HERE! 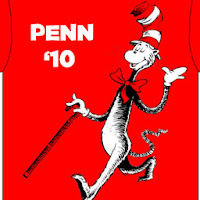 I love how in 2009, all the undergrads use the web to promote everything from their candidacy, to fraternity parties, to fundraisers and now ...Hey Day t-shirt designs! The t-shirt design to the left by Audrey Menco (C'10) is this year's winning design. Check out the other Hey Day t-shirt designs HERE. I also thought another contender was the "Obama"-esque design. These designs all look way cooler than the t-shirt I had back in 1995! Catch up on Hey Day videos from the past! David P. France (C'89, Arts House Dance, Penn Media Summit Creator), my fellow co-winner of Penn's first Young Alumni Award of Merit back in 2004, has just started his own dance company (the "David P. France Dance Company") in Basel, Switzerland and New York City. David also stars in and executive produced the above video called "Canticle." "The key element is the music video: which signifies specific movement vocabulary of my style, seen in the staged concert piece Psalm 27 (2006). This duet reconstruction was taught and filmed over the course of 48 hours, in collaboration with the David P. France Dance Company (based out of Basel, Switz). More details regarding the video. I’d like to take a minute, however, to give my personal testimony regarding the work and why I feel its actualization will engulf a good portion of my life. I immediately asked to join the choir after that mass. I began to attend 5 masses a week. I noticed that I felt rhythmically and emotionally moved to dance to some of the songs we performed on a regular basis. I took notes in my hymnal for over a year before the idea to sync 7 of my favorite songs into a dance concert piece arose. I wanted the parishioners to see what I saw in my mind when I heard those melodies. So many Christians, especially Catholics, see the body purely as sacred and void of engaging the physical ability to worship; that worship is solely through prayer and song. My premise is that the body, along with the voice, can (and must!) be united to give glory to our Creator. Also, that the songs can be arranged rhythmically to insight those listening, not only inspiration, but also, to get up and dance. This is a natural response; there is nothing wrong with it. People need to know that. The Lord is my Light and my Salvation; of whom shall I be afraid? The Lord is the stronghold of my life; whom shall I fear? There is no doubt in my mind that I couldn’t have survived some of the trials I've had to face, if I hadn’t heard these words through song. My job as an Artist is to shape and extend this experience through the talents I have been given. Quite simply, my only hope is that this passion I feel can be shared. Regardless, of religious affiliations. I was attended catholic schooling for 13 years. I didn’t learn a damn thing about faith until I joined that choir. Now, I might be ex-communicated one day for my views on the combination of sexuality and spirituality, but one thing is certain: I will not shut up. Although the continuation of Psalm 27 is only one of several life-term projects I’ve set for myself, it will always be a central part of my being and character." Yesterday, I showed a great video of a high school student logging onto the Penn admissions site to see whether she got into Penn. But if we take it a step back, what determines whether a high school prospect even wants to go to Penn? Over the past few weeks a bunch of high school students were taking their "College Tour '09" and visited a bunch of campuses to determine which school/s they were feeling the love from. Take a look at the video above which documents these students' impressions of Penn. Mostly positive with one negative... which I disagree about..as will you. 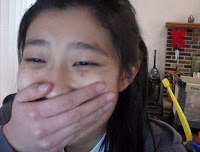 In the image to the left, do you think Amy Guo's face reads "accepted" or "rejected" from Penn? Watch above as this 2013 early decision candidate logs online to find out her fate into the Engineering School (how very 2009!). It's nice to know that students these days can log onto the Penn admissions site and instantly find out. On a related note, if you recall, I posted a video of a candidate getting accepted HERE and another candidate getting waitlisted/rejected HERE. And check out how HERE how Penn is now phasing out paper rejection letters!